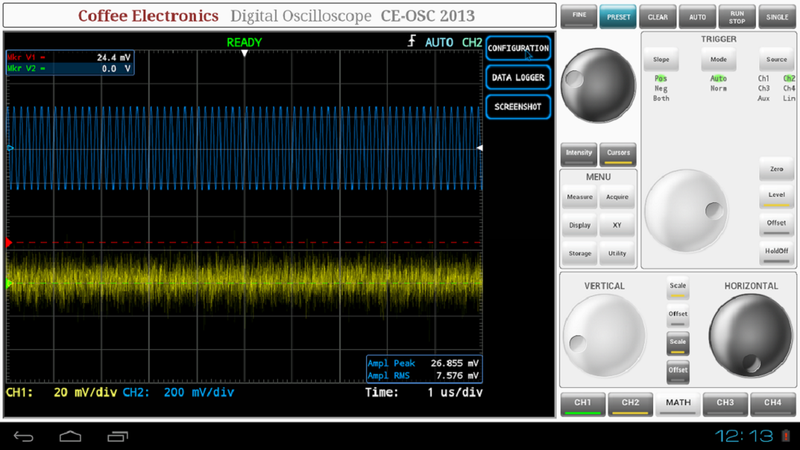 The Oscilloscope function in the Coffee Electronics eLabin1™ R&D is available with DSO analog bandwidths between 20 MHz to 450 MHz. It samples the signal with 500 MSPS per channel (2/4 channel operation) or 1 GSPS (1/2 channel operation). Choice between True 8 or 12 Bit resolution, which can be enhanced up to 16 Bit digitally. Having a AC/DC input @ 1MΩ/50Ω, it supports several analog and digital filters, a variety of trigger possibilities and analog-like display for easy recognition of noisy signals and glitches. The graphical user interface displays an ergonomic and simple instrument offering all the capabilities of a 2 or 4 channel oscilloscope: 2ns/diV for the 100 MHz version, 1mV/diV sensitivity, full digital trigger with several trigger options, mathematic channel and a wide variety of markers and auto measurements. Be amazed by the quality of the real time display, with different trace brightness steps depending on the monitored signal. The eLabin1™ R&D Spectrum Analyzer combines the best from both analog and digital worlds. Noise floor displayed in the way of analog instruments while monitoring the signal with the accuracy of digital processing. The spectrum will be updated real time, showing different intensity and shades according to its duration. Spurious signals buried in the noise can be easily detected, just like in the time of the good old analog spectrum analyzer. The eLabin1™ R&D Spectrum Analyzer offers additionally the amazing graphic capabilities of high end instruments. Spectrum Analysis is extended by the time dimension, introducing the real time ‘waterfall spectrogram’ of Coffee Electronics. This feature is great to analyze and understand FM modulated signals among others. Choose your preferred false color mapping for better representation. 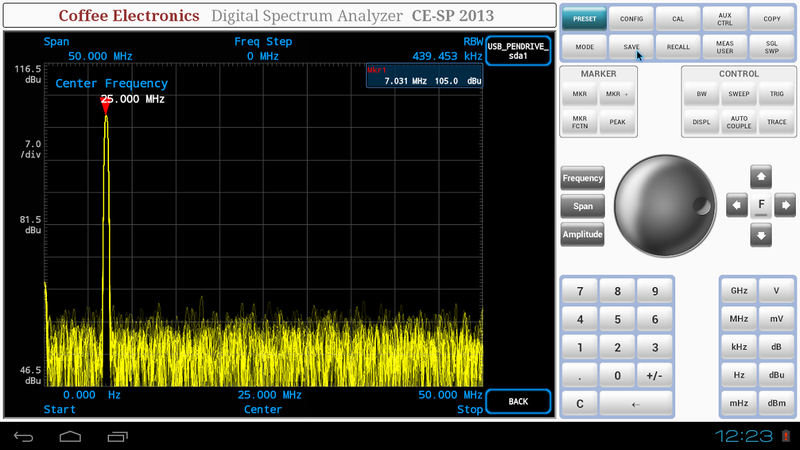 All functions of the spectrum analyzer are available in this mode, different resolution and video bandwidths, filters, etc. 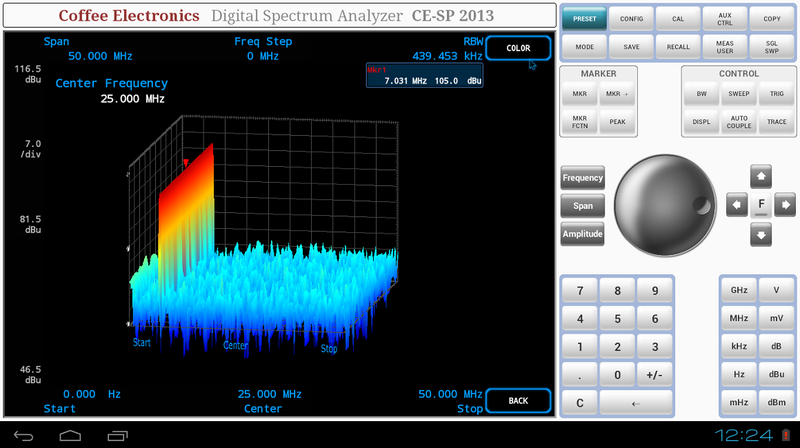 Coffee Electronics offers a Real-Time 3D Spectrum Analyzer. AM and FM modulated signals can be represented and analyzed the best in this mode. Signal display while rotating the graphic (via touch or mouse) in all desired directions amazingly fast and smooth. 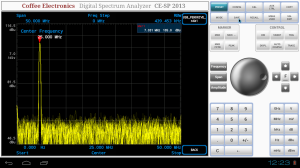 All functions of the conventional spectrum analyzer are available as well. The result of extensive studies on ergonomic aspects, the eLABin1 RF-Generator from Coffee Electronics simply works. 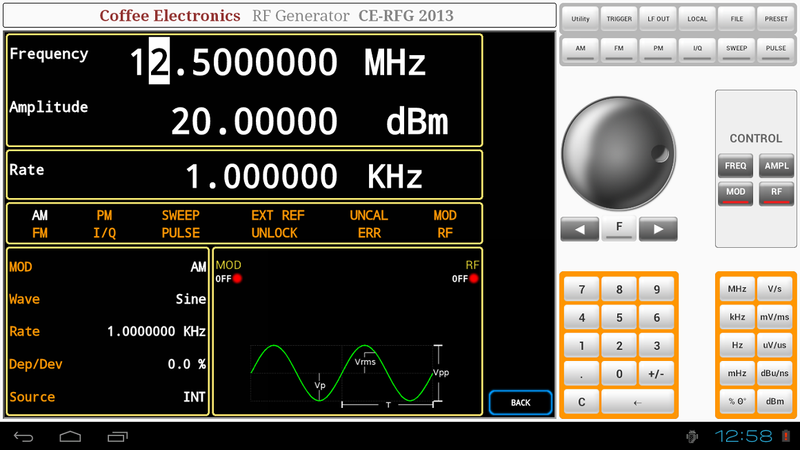 Changing the settings of this RF-Generator is intuitive for users of any generation. Besides basic adjustments of amplitude (up to +30dBm) and frequency (6 GHz in 0.1 Hz steps), several modulation modes FM / AM / PM are available. The eLabin1 R&D RF-Generator provides an outstanding accuracy with less than 2ppm frequency error at the offered price. 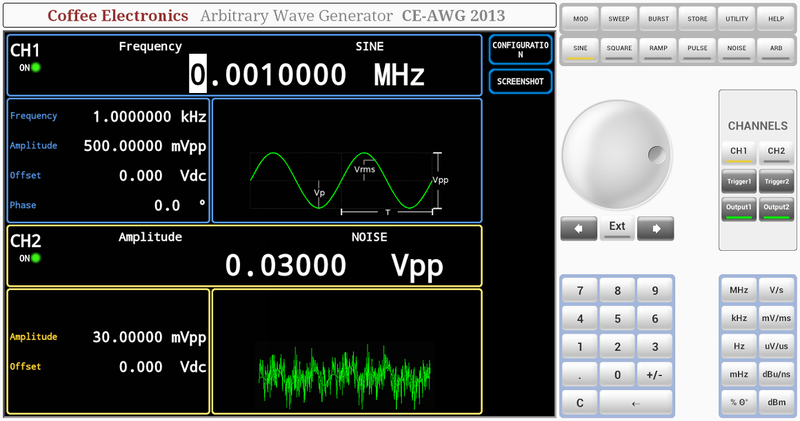 eLabin1™ R&D also includes a Double-Channel Pulse & Arbitrary Wave Generator AWG. It generates base-band signals up to 110 MHz or complex band-pass signals with 200 MHz bandwidth per channel. Both channels are coherently synchronized. A wide choice of signals and pulses are available: sine, square, pulse, triangular, noise, arbitrary etc. Easy-to-learn graphical interface. 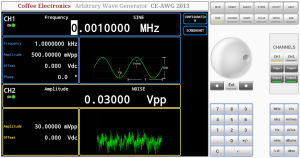 Possibility to analyze generated signals with the spectrum analyzer or oscilloscope at the same time. For detailed technical information please contact us and check out the future versions of eLabin1™ R&D and other eLabin1™ Applications.